Halifax have signed the Widnes half back or full back Danny Craven on loan. Craven, 23, will not feature in Friday night’s Challenge Cup showdown with Super League outfit Wakefield at Belle Vue (7.30), but will be in contention for next weekend’s crucial clash with Sheffield Eagles at Doncaster. 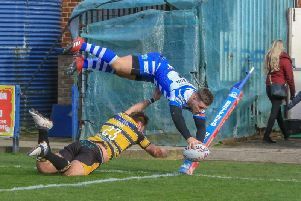 Fax boss Richard Marshall has seen his playmaking options diminished following the retirement of Paul Mennell and the loss of Matt Place, who has returned to Australia, while another key attacking weapon, full back Miles Greenwood, is expected to miss most, if not all, of 2015 with a broken leg. “Danny is comfortable at half back or full back, so he gives us options in areas where we don’t have that many at the moment,” said Marshall. “He’s a young player, but he’s probably played 50-plus Super League games for Widnes since 2010, so he’s got some experience under his belt. “He’s got a good kicking game, and he can also take the line on.